With a little imagination, this recipe can be adapted to any holidays. 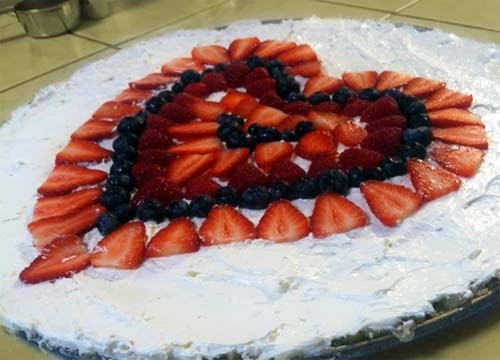 With the use of raspberries, blueberries, and strawberries laid out in the shape of a heart, I present to you, a Valentine's Day Fruit Pizza. 1. Preheat oven to 350 degrees F (175 degrees C). Slice cookie dough and arrange on greased pizza pan, overlapping edges. Press dough flat into pan. Bake for 10 to 12 minutes. Allow to cool. 2. In a large bowl, soften cream cheese, then fold in the whipped topping. Spread over cooled crust. You can chill for a while at this point, or continue by arranging the fruit. 3. Begin with strawberries, sliced in half. Arrange in a circle around the outside edge. Continue with fruit of your choice, working towards the middle. If bananas are used, dip them in lemon juice so they don't darken. Then make a sauce to spoon over fruit. 4. In a saucepan, combine sugar, salt, corn starch, orange juice, lemon juice and water. Cook and stir over medium heat. Bring to a boil, and cook for 1 or 2 minutes, until thickened. Remove from heat, and add grated orange rind. Allow to cool, but not set up. Spoon over fruit. Chill for two hours, then cut into wedges and serve. For more fruity desserts, see this tart recipe.